Mirabel discovered Project PRISM through a family friend who advised her of Goodwill’s commitment to providing training, employment and supportive services. Project PRISM is a partnership between Goodwill and Ascension Wisconsin. Mirabel enrolled in Project PRISM and worked to build her confidence and improve her communication skills. Mirabel enrolled in Project PRISM and worked to build her confidence and improve her communication skills. She is now a Customer Service Representative and is a stronger and more empowered woman than ever before. 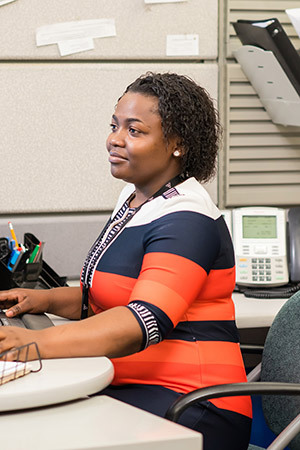 TalentBridge, Goodwill’s staffing and recruitment service, and her coworkers at Ascension have helped Mirabel further by integrating her into an American work environment, while respecting her culture and heritage. Coming to the United States has been a dream come true for Mirabel. In the future she hopes to have her daughter join her in the United States so she can see her mother living the American dream. Mirabel sees life’s difficulties as merely an opportunity for a positive change.